Weeks Wholesale Rose Grower, Inc. was founded in 1938 by O. L. and Verona Weeks in Ontario, California. This highly respected company whose reputation reflects their high standards and integrity came to be known as the 'Tops In Roses'. In 1985 Ollie and Verona retired and sold Weeks to Charlie Huecker and Bob DeMayo. 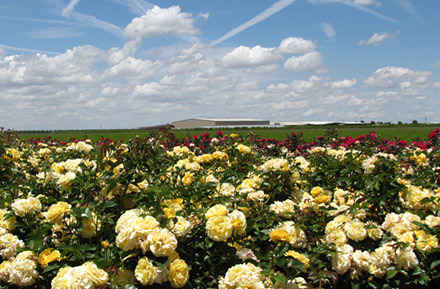 The name of Weeks has become synonymous with personal service and top quality roses throughout the U.S.
Our state-of-the art processing, refrigeration and distribution center is located at our growing grounds in Wasco, California, in the middle of the San Joaquin Valley. Weeks has over 1,200 acres of production facilities in the same area as many of the other major rose producers. Wasco has a good deep loamy soil, plentiful clean well water and a natural climate that fits commercial rose production particularly well. In Wasco we can produce strong healthy bushes that ship easily and adapt well to most any climate in the United States. Our research and licensing office is located on the Cal Poly Pomona Campus along with our hybridizing greenhouses and display/test gardens. Beginning in early December and ending about mid-February, Weeks Roses ships over four million bareroot roses throughout the United States. Immediately following harvest, our roses are carefully graded and packed in strong boxes, then shipped in temperature-controlled trucks, where applicable, either directly to our customers or to various strategically located cold storage warehouses and made available to our nursery and garden center customers when they are ready in their particular area. Today, Weeks Roses is part of the Gardens Alive! family of horticultual companies.